Creepy new feature alert! Creepy new feature alert! Buried in the Settings menu of the latest beta version of iOS 7 is the somewhat unsettling ability to see everywhere you've been since upgrading the operating system. It makes you wonder: Who else can see these maps? The new feature was pointed out on Wednesday morning by a hacker news commenter and then explored by BuzzFeed's Charlie Warzel who confirmed with Apple that this is a consumer-facing feature, not a developer bonus. 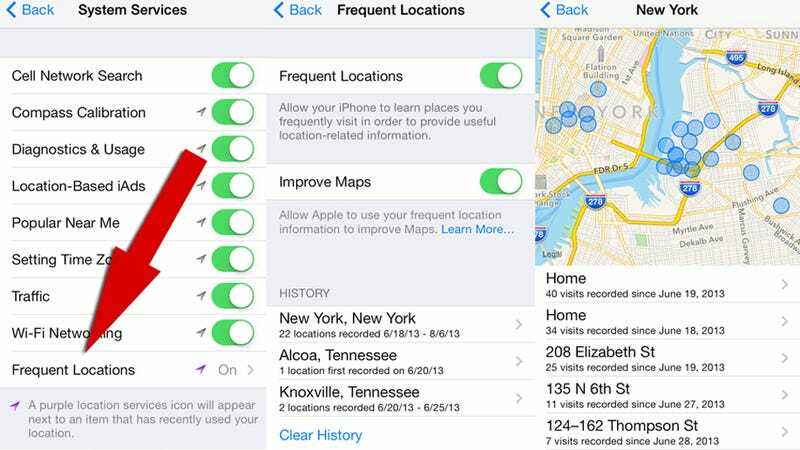 You just go to your iPhone Settings, then Privacy, then Location Services, then System Services where you'll see a very curious option to see your Favorite Locations. It is exactly what it sounds like: a map of the places you've visited most frequently, down to the (thankfully slightly inaccurate) street address.